An ‘adventurous’ trip to Thailand would not be complete without trying one of the country’s exotic snacks: insects. Okay — I know what you’re thinking. It’s crazy, right? Like, who would even dare to eat those creatures?! Yep, I’ve tried them! But before I go on, I should clarify that eating insects during my visit to Chiang Mai – Thailand wasn’t my first time to do so, and that’s because I have already tried it once back in the Philippines*. *NOTE: Unlike Thailand, Beijing, Laos, Cambodia etc., the Philippines [PH] doesn’t commonly sell and eat insects as a ‘street food’. It’s more like a ‘specialty’ in few select areas like in Pampanga. So why was I willing to eat these insects again? Because the ones that they have in Thailand were different. Unlike the cute little crickets that I previously consumed in the PH, the Thais have it bigger and scarier! For example, they have these ridiculously big crickets that looked like it was fed with steroids! But thankfully, such things didn’t happen. After a bit of a fight with my mind (mind you, I am personally terrified of these creepy crawlers — holding it with my fingers at that time was already freaking me out! ), I finally managed to pop one big cricket into my mouth! …Seconds later, I realized that it wasn’t so bad. 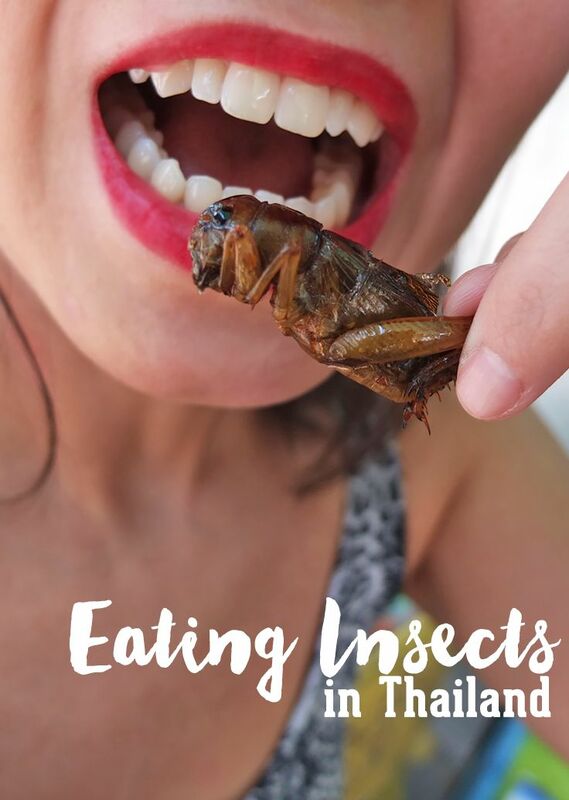 I was told that sometimes, these edible insects can also be an ingredient in certain Thai dishes, but that most of the time, it is customarily a ‘street food’ served in platters or takeaway bags, acting as a perfect snack while drinking beer. If you ask me, I can imagine people pairing this with rice as is, as they treat it as some sort of viand! Now, would I recommend YOU to try eating insects? Absolutely. Other than having the bragging rights of having eaten one or a lot (oh yeah! ), it’s also a good life and travel experience that you can recall/retell over the years. Plus, the battle within your wits as you build up the courage to pop one into your mouth can be quite a… refreshing experience. This is because you know you want to challenge yourself, you know you want to try it out, but a huge part of you is oozing out so much fear and reluctance — it’s like an inner battle and though it can be nerve-wracking at first, the process as it builds up to the ‘finish’ can be quite fun! Besides, like what Bear Grylls keeps saying, these insects pack a LOT of protein and are low on fat. So why not? You might end up liking its ‘flavor’ too, much like the locals! » Where can I find these edible insects? During one of the food tripping sprees that I was doing with a friend in Chiang Mai, we chanced upon a stall that was selling insects. After our ‘experience’, we walked some more to a busy street and we ended up seeing yet another stall. So basically, the answer is: “they can be found and bought almost everywhere” because at one point or another, either in a busy street or in a night market, you will come across a small insect stall/cart/vendor — and it will be hard to miss! (Surely, big piles of ominous-looking creatures displayed out in the open will quickly catch your attention). Otherwise, you can always ask someone for directions or tips and they will be more than glad to help you out. » How did this ‘insect-eating’ mania came to happen? Apparently, snacking on insects originated mainly from the northeastern part of Thailand and there is a theory that it became popular across the country when the northeastern Thais brought it to the bigger cities like Bangkok, Phuket and Pattaya as they ventured to look for bigger jobs. It’s said that those parts were generally poorer and since crops were often hard to grow and raising cattle was more difficult, the locals had to find a way to nourish themselves — therefore, they resorted to insects and bugs that are easy to catch. It eventually evolved into their favorite snack! NOTE: Today, eating insects is not regarded as an ‘act’ that is only done by the poor people because it’s quite a craze even for the upper classes of Thailand! You might actually spot a wealthy businessman stopping over to a stall to get his ‘fix’. » Where do they get these bugs? Some are caught in the wild while others (like silk worms or crickets) are raised or cultured on insect farms in the north and northeastern parts of the country. » How much would it be? One platter/bag/stick costs ฿20 baht (or $0.6+) and the biggest portions can be at ฿50 baht ($1.5+). If you only want to try one piece, they will charge ฿10 baht ($0.3+). » Is it really safe to eat insects? To add more credibility to the ‘safety’ of entomophagy (the official term of the human consumption of insects as food), the U.N. had a recent report that confirms how insects are generally high in nutritional value. To be precise, it has higher protein content and quality than any meat or fish! – meaty / the biggest at around 3.5″!!! Like I’ve already mentioned, eating insects (or worms, arachnids, etc.) can be quite an experience and you can benefit greatly from the nutritional value that you can get from them! If however, you really can’t stomach these things, you can simply opt for the usual flavorful Thai dishes that are known for being rich and tasty! Would you try one of these edible insects at least once? Why or why not? Or have you tried it before? How was it? What’s your ‘favorite’? Come to Romania!! Food taste better here :) , we don't eat bugs, worms or any other things like that. I would be happy to be your guide. Haha, well every place has its quirks ;) Thanks Robert! I hope to visit Romania soon and thanks for your offer :D I'll keep it in mind! I did try worms, both silk and bamboo, in Chiang Mai. Quickly came to conclusion that it was not my cup of tea, so that was it (haven't progressed to any other crunchy creatures). Admittedly, they were not too bad, but... no, thanks. Yes, yes and yes, I would eat these guys! I would squirm and procrastinate, but I know in the end I would do it. Mostly for saying that I did it, but also because I am genuinely curious what they taste like! The only time I have ever eaten an insect was when I had a cricket lollipop. The lollipop was delicious, but the cricket inside was very tiny and once I got to the middle I just crunched it with the rest of the candy and could barely tell I was eating a bug! I am currently living in Korea, and while insects are definitely not a thing that is consumed here often, there is beondegi here, which is silkworm larvae. I have yet to try it (I will!) or even see it, but apparently they are popular street food snacks.When you bite into the silkworm it explodes in your mouth! Mmmm! Ha! I did just eat some live octopus at a fish market, very tasty and interesting experience that I highly recommend. Hopefully I will be traveling to Thailand in the coming months and I will absolutely try eating insects. I just picture my boyfriend enjoying it and buying a bag. The two of us, strolling through the streets of Chang Mai munching on crickets and drinking beer! Oh how our friends at home would be shocked! Thanks for sharing this very interesting AND informative story! Super engaging! I have been to Thailand but I was so scared to try it! We ate a lot that day and I think that my stomach will be more upset if I ate one of those. They're so big! haha. I wish I tried though. Maybe next time. As a kid, we are used to eating grasshopper at Cagayan Valley! Awesome! How big were they though? The ones they had in Thailand were craaaazy big!